Conductor Laureate Tadaaki Otaka returns to the BBC National Orchestra of Wales to open their new season this week. An acclaimed interpreter of English music, Tadaaki conducts Vaughan Williams’ Fantasia on a Theme by Thomas Tallis and Songs of Travel, for which he’ll be joined by the world renowned baritone Sir Thomas Allen. The second half showcases Mussorgsky’s celebrated Pictures at an Exhibition. Next month Tadaaki returns to London to sit on the jury of the Donatella Flick Conducting Competition. Other highlights this season include visits to the National Polish Radio Symphony Orchestra, Stavanger Symphony Orchestra, Auckland Philharmonia and Taipei Symphony Orchestra. He also conducts Brussels Philharmonic Orchestra for the Piano Festival of Flagey and serves on the jury of the 18th Tokyo International Music Competition for Conducting. Tadaaki continues to work extensively in his native Japan with the country’s leading orchestras and is highly regarded as a teacher of young conductors. 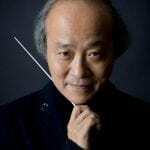 Tadaaki conducts BBC NOW on 4 October at St David’s Hall, Cardiff. Find out more here. The concert will be broadcast live on BBC Radio 3, and available on iPlayer for 30 days after.